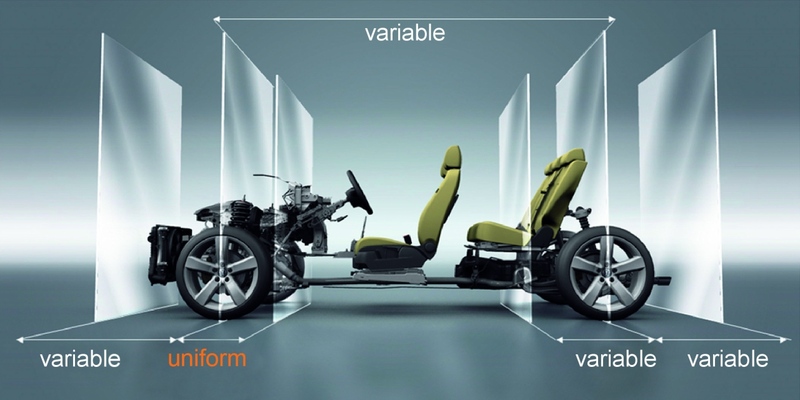 Volkswagen presented last February its new platform called MODULAR TRANSVERSE MATRIX - the German acronym is MQB ( MODULAR QUER BAUKASTEN ) - for the Volkswagen, Audi, Skoda and Seat brands. This platform will be shared by a larger number of models within the Volkswagen's group in relation to current platforms. It's an important enhancement in automotive production representing a turning point in the design and production of future automobiles. 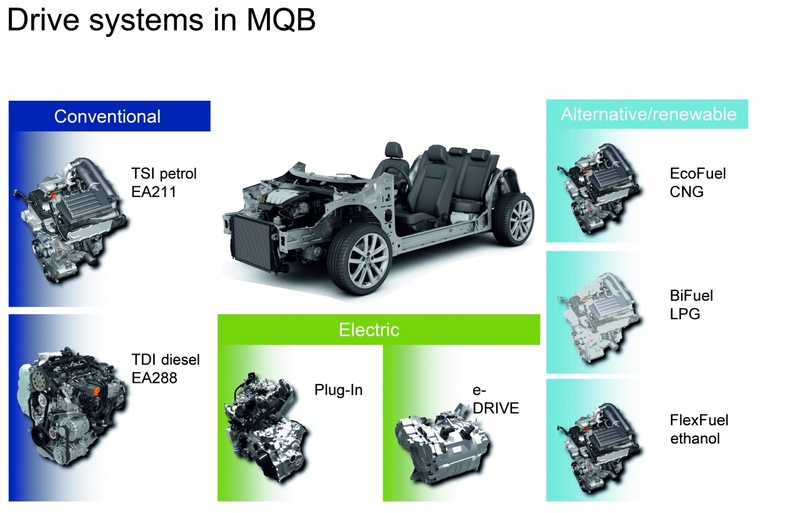 VW expects to cut costs, production time and cars weight with the MQB platform. This platform represents a major step forward in VW's strategy to become the world's largest auto manufacturer by 2018. The Volkswagen Group is based in Germany and is one of the world's leading automobile manufacturers and the largest in Europe. The Group is made up of ten brands: Volkswagen, Audi, SEAT, Skoda, Bentley, Bugatti, Lamborghini, VW Commercial Vehicles, Scania and MAN. Each brand has its own character and operates as an independent entity on the market. The product spectrum extends from low-consumption small cars to luxury class vehicles. It also has a stake in Porsche AG, which is expected to fully integrate the VW Group in the short-term. The strategic plan of the company called "Strategy 2018" aims to make the VW Group worldwide leader in 2018. Over the long term, VW aims to increase unit sales to more than 10 million vehicles a year and intends to increase its return on sales before tax to at least 8%. To achieve these goals, the MQB platform will play an important role. Usually, each automobile platform is designed specifically for a market segment and shared between cars of similar size. A typical mass-market VW platform spans not just several model variants, but in fact underpins a variety of models sold under different brands. VW is now creating shared modular platforms to serve the needs of its different subsidiaries. 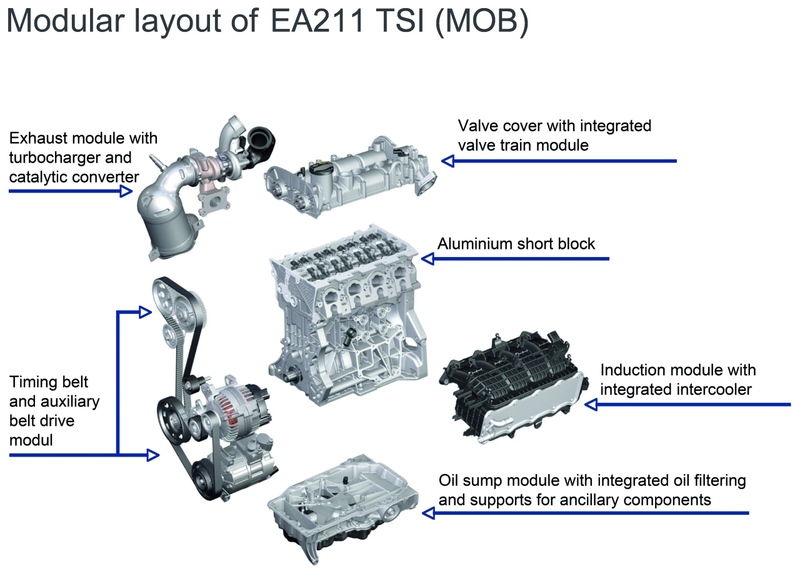 The MQB platform is the most recent and will be used for mass-market models with front-wheel-drive cars, for which the engines are transversely mounted. The modular part of its name refers to its versatility in size and type configurations. With the MQB platform the only dimension that is fixed is the distance from the front axle to the firewall. Front and rear overhangs, wheelbase, width, and track all can shrink and grow. THE MQB PLATFORM allows the Volkswagen group to produce worldwide high volume and niche models at extremely competitive costs over the long term. The MQB exploits synergies in key technologies and allows greater economies of scale through the production of more models with the same platform. 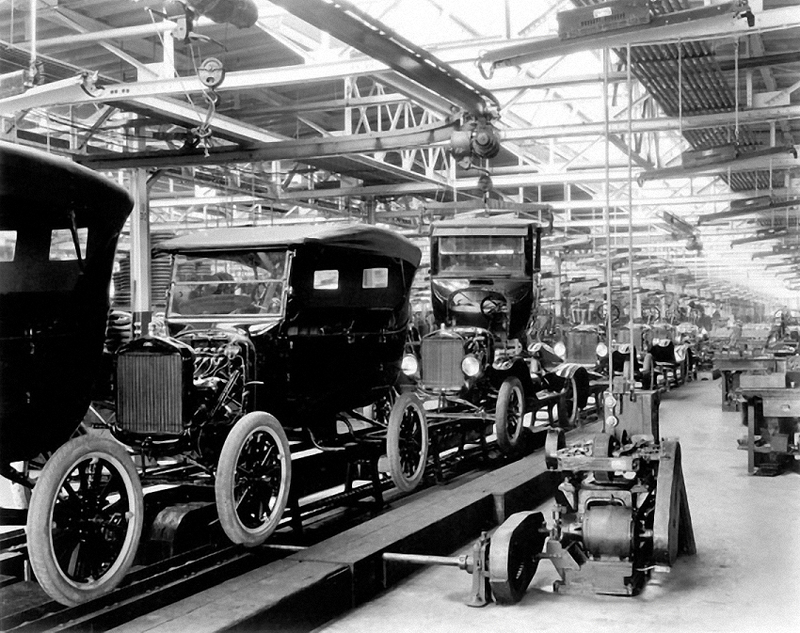 Since the invention of mass production by Henry Ford in the 20's, this may be the most revolutionary step in the automobile development and production. 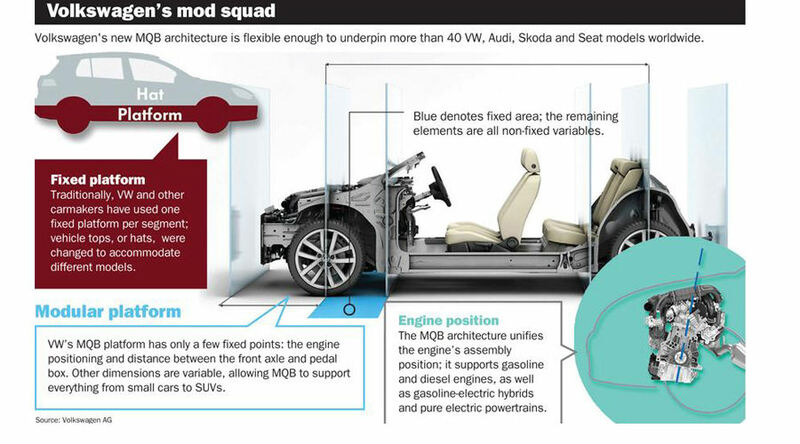 The modular platforms concept is a major structural advantage for VW's in the global automotive industry, allowing it to reduce costs and be more competitive on prices. By this way, it can gain market share from General Motors and Toyota to become the world's largest automotive manufacturer.